••• Jade Sparks has only wanted to be in charge of Yellow Stone Pack, and not look for her mate until she was ready. She enjoys having 'girls' night out' with her friends, and staying as free as possible. When she finds her mate, she doesn't feel anything for him. So in order for him to sign a treaty, he wants Jade in return. 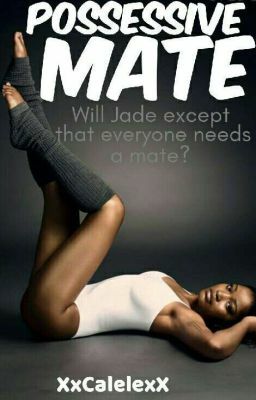 Will she except every one needs a mate? ••• Samantha Summers is Jade's best friend who sticks by her. When Jade found her mate, she told Sam, but wouldn't say who. Before she knows it Sam's running outside seeing Jade naked and hanging over Colton Connors' shoulder. The Alpha of Blue Moon pack. The one Yellow Stone is supposed to have a 'treaty' with. "Let go of my bestfriend, you dickhead!" Sam screams. Colton flings her into a tree. By the time she wakes up from the hospital, Jade is gone. ••• Colton Connors has one thing on his mind when he sees Jade in the grocery store: mine. Ever since his wolf came out, he started to smell something sweet in the air while visiting another pack. The second time he saw her was when he tracked her down to her pack and snatched her away from her family. He regrets harming her besfriend, but what's done is done. Will Jade be able to accept him when he keeps making mistake after mistake? What will he do if Jade rejects him? ••• [Achievements] ~#3 in the Purple Awards ~176 in First book ~Over 9k Reads ~Over 400 Votes ••• [Disclaimer: © XxCalelexX 2017. No part of this book may be reproduced or distributed without written permission from the author. (Me). This book is entirely fictional. If there is any reference to people dead nor alive, it is entirely coincidental. Don't steal my idea. Please remember this book has Mature Themes, Scenes, and Languages.] ••• Don't forget to show support by Voting, Commenting, and Sharing.